This winter has been exceptionally cold and snowy, with weather extremes everywhere it seems. For me, nothing combats these winter chills quite like a tasty bowl of chili. This Chipotle Quinoa Chili is healthy comfort food that will warm you up from the inside out. There is a little heat from some green chiles, a subtle smokiness from the chipotle chiles and all around goodness from the protein-packed beans and quinoa. I had never had quinoa in chili until this recipe, and it is a delicious addition! Quinoa adds a wonderful texture, adds some protein and fiber, and makes the chili seem especially hearty…. Lentil Tacos are a hearty, vegan dish made a little spicy and a lot delicious. Even meat lovers will enjoy these high-protein, fiber-rich, vegetable-packed meatless tacos! Lentils are one of my favorite ingredients to use in healthy, meatless recipes. They are high in protein, fiber and are so versatile. Lentils are quick cooking, which makes them excellent for weeknight meals. We enjoy them in salads, pasta sauce, and here as Lentil Tacos. Jalapeno Hummus is a healthy dip (or spread) with a little jalapeno kick. Luckily it takes only 10 minutes to make, because this popular hummus disappears quickly! With the Big Game just around the corner, I have been putting the finishing touches on my menu planning and coming up with some fun recipes. In fact, it’s almost like planning for the holidays – mass quantities of lots of tasty foods to share with family and friends! After making Sweet Potato Hummus, I have been looking forward to making more varieties of homemade hummus. This time I thought something a little spicy was in order ~ something like Jalapeno Hummus! With just a few simple ingredients and a food processor (or blender), you are 10 minutes away from one of the best hummus recipes ever! Jalapeno Hummus is flavorful without being too spicy. All of the flavors blend very nicely, with a little jalapeno kick at the end. The recipe can easily be doubled (or tripled! ), making Jalapeno Hummus ideal for game day entertaining. From busy weeknights to inexperienced cooks and everything in between, Quick and Easy Salsa Chicken is a simple yet tasty recipe that everybody needs to have in their recipe box. Three Bean Vegetarian Chili, also known as “Veg Head” Chili, is one of our favorite recipes to make during the cooler months. This chili is hearty enough to satisfy meat eaters and vegetarians (and vegans!) alike…due to the addition of the third bean ~ refried beans! The refried beans are an unexpected addition that thickens the chili perfectly and gives it a the nice hearty texture. 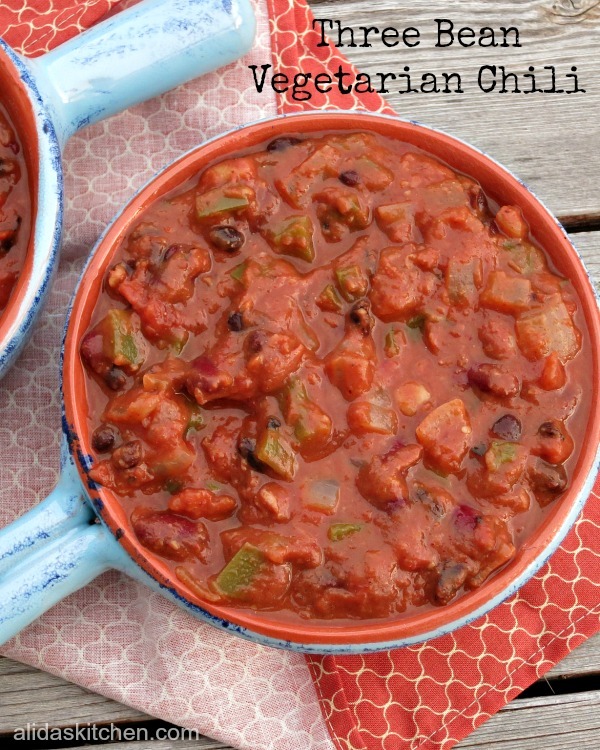 Combined with the other beans and all of the vegetables and spices, this chili has quickly become a family favorite…. With Fall upon us, I am in full pumpkin mode. So far I have made pumpkin cake, pie, pasta, muffins, and still have more pumpkin recipes I want to make this season. Not only do I love pumpkin puree, I also adore pumpkin seeds and pepitas! Pepitas are the lovely little raw green seeds inside the pumpkin seed shell. They are a great alternative to nuts, yet offer many of the same health benefits. Like nuts, they are packed with protein, vitamins and antioxidants. I find them in the bulk bin at the grocery store or sometimes near the bags of sunflower seeds….